The North Las Vegas bedsore injury attorneys of Nursing Home Law Center LLC prosecute claims against nursing facilities that have neglected to take reasonable preventative measures which have been proven to greatly reduce the number of pressure sores in patients who must remain in the same position for extended periods of time. When we consider how simple these measures are, it is impossible for any patient presenting with an advanced stage pressure ulcer to have received the attention or service that the home promised to deliver. By holding these care centers accountable, we hope to send a message to the industry that this behavior will no longer be tolerated. North Las Vegas is a rapidly growing city just outside of Las Vegas and its blustering population is now over 234,000, with 7.1% of its residents aged over 65. Many more are preparing to retire and due to require access to senior programs and assistance in the next decade. Fortunately, there are numerous senior centers located throughout the area equipped to meet these demands. Senior centers provide ample opportunity for aging residents to maintain their physical abilities through exercise, to gain free access to health and wellness screenings, to mingle with peers and meet likeminded individuals and to enjoy social and recreational activities. 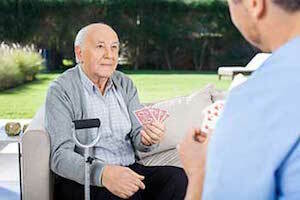 To find a center that is close to you, simply visit http://www.vegas4locals.com/resources/las-vegas-senior-centers/ to access a directory of centers and to see what services each one provides. There are currently 31 nursing homes serving North Las Vegas, which should provide plenty of options for those who need to place a loved one under assistive care. Only five of them have received perfect ratings by Medicare, however, which is enough reason to give anyone pause. Reviewing the Medicare grades for the home you are considering may just prevent you from placing your loved one in the wrong environment. Our North Las Vegas pressure sore lawyers suggest using the nursing home compare tool at https://www.medicare.gov/nursinghomecompare to eliminate homes from your search that have been cited and penalized or don’t have staffs that are adequate to meet patient demands. This comprehensive tool allows you to compare facilities side by side and to narrow your search by facility type, payment forms accepted, overall score and distance. We’ve found that people have much greater confidence about the choices they’ve made when they are able to access the information this tool provides. One of the most definitive signs of systemic nursing neglect that we notice is the development of bedsores throughout a facility. Preventing and treating pressure sores is a simple process that requires the most basic of care, which means that the failure of staff members to cater to the needs of these patients is conducive to neglect on a systemic level. All caregivers need to do to prevent the formation or worsening of a bedsore is to routinely move the patient so that circulation is restored to areas of the body that have been cut off due to pressure on the joints. During the repositioning of patients, it is easy to tell if they have any existing sores and treating early stage ulcers only requires the application of conventional medications. For this reason, if patients are suffering from advanced stage wounds, it is a sign that the facility is severely understaffed and not equipped to meet the needs of its patients. Nursing Home Law Center LLC has been able to recover compensation on the behalf of thousands of nursing neglect victims, which is why we are confident in our ability to advocate on behalf of your loved one. Contact us today to arrange a free consultation with one of our award winning North Las Vegas bedsore injury attorneys so that we can let you know more about the ways we can ensure your claim has the best possible chance of success. If we are unable to secure damages on your behalf, we guarantee that our services will be free.